More than 600 books and manuscripts lost during the Second World War were today returned to Bonn University in Germany. The repatriation was facilitated by Sotheby’s. The books were discovered in a Belgian private collection. This is one of the largest single returns of objects lost during the war. Among them are numerous historical works of high cultural and material importance, including medieval and modern manuscripts, medieval documents, historical maps, early 15th-century prints, rare prints of the 16th century and numerous colored bird books. The most valuable bird book is Audobon’s The Birds of America. Charlotte Miller, Specialist in Books and Manuscripts at Sotheby’s in London explained that in 2017 a large collection of books was offered to Sotheby’s from a private collection in Belgium. Many had their library stamps expunged, bindings removed or title pages destroyed. Sotheby’s set out to discovered the true provenance of the library. The medieval manuscripts were listed on Bonn University’s Inventory of Losses. A Fabergé tiara wedding gift from Frederick Francis IV, Grand Duke of Mecklenburg-Schwerin (1882-1945) to his bride Princess Alexandra of Hanover and Cumberland (1882-1963) comes up at Christie’s sale of Magnificent Jewels in Geneva on May 15. The 1904 tiara is of symbolic design with forget-me-not flowers tied with ribbon bows, signifying true and eternal love, pierced by arrows representing cupid. 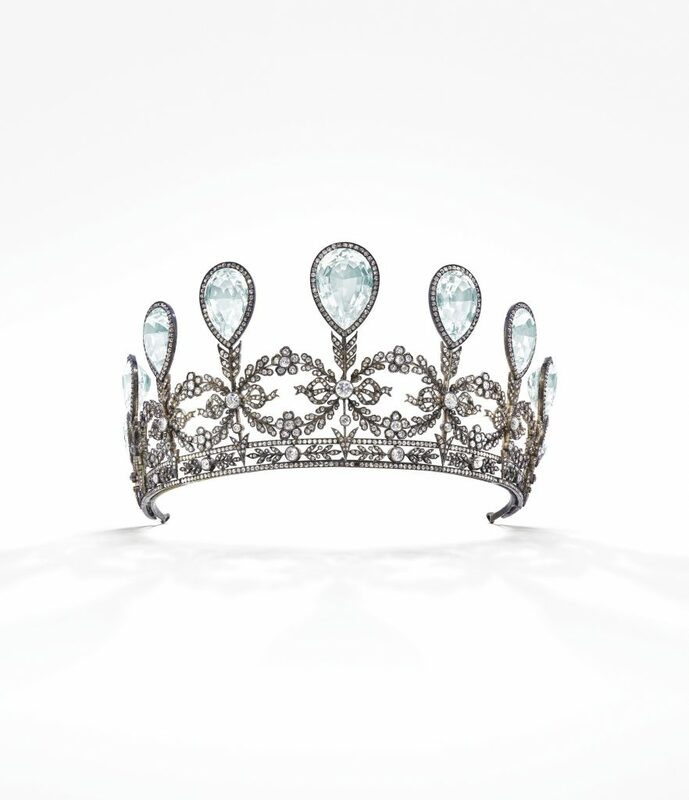 Composed of nine graduated pear-shaped aquamarines, old, cushion and rose-cut diamonds, the historic tiara has a pre-sale estimate of US$ 230,000-340,000. The Grand Duke’s mother, Grand Duchess Anastasia Mikhailovna of Russia, was a keen Fabergé collector, and encouraged him to order his wedding present at the atelier Fabergé in St Petersburg. At the time of their 1904 marriage Frederick was 22 and Alexandra, 21. Archives show correspondence between the Grand Ducal Cabinet of Mecklenburg-Schwerin and Eugène Fabergé, revealing deliberations on a commission of an important jewel. One of the letters dated 10 May discussed the possibilities that could be offered: ‘a diamond tiara’ for 10’000 roubles or ‘an aquamarine and diamond tiara’ for 7’500 roubles, and that only using aquamarines as gemstones was not possible. Another letter referred to drawings with designs Fabergé proposed for the top section of the tiara, sent to the Grand Duchess Anastasia Mikhailovna for her son’s approval. However, these drawings went missing. Fabergé expressed concerns that he held no copies himself and did not know which design appealed to the Grand Duke. Two weeks before the marriage Fabergé wrote to the Grand Ducal Cabinet that he was yet to receive any instructions to proceed. For a second time he asked for the return of the drawings as he could not advance his work without them. A subsequent letter referred to a completion for the wedding on 7 June, as requested by the Grand Duke by which Fabergé declared that it was impossible to execute the commission in such a short time. On the day of the wedding the Princess wore the traditional Hanoverian nuptial crown commissioned in 1761 for the wedding of King George III of England and Queen Charlotte of Mecklenburg-Strelitz. The Fabergé tiara, her own special wedding gift from the Grand Duke, followed later. Dublin Mint Company Commemorative Coin. A War of Independence medal was launched today by the Dublin Mint Office to mark the 100th anniversary of the start of the War of Independence. It shows an image of the Garden of Remembrance on one side, and Hibernia, the personification of Ireland, on the other. The image of Hibernia is based on original 19th century Irish coinage. 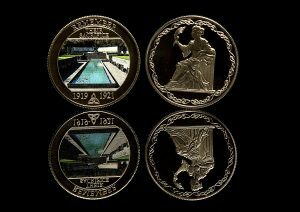 The Garden of Remembrance, which is presented as a photographic image on the medal, was selected to feature due to its dedication to the memory of all those who gave their lives in the cause of Irish freedom. Medals commemorating the Easter Rising and the seven signatories of the Proclamation of the Irish Republic were released in 2016, to mark 100 years since the rising. More recently a Michael Collins medal was released to commemorate the 80th anniversary of the end of the Irish Free State in 1937 and the establishment of the new state of Ireland. The Heart of Space meteorite. The Heart of Space, an iconic iron meteorite in the shape of a heart, will highlight Christie’s fifth annual online auction of meteorites. It will run from February 6 to 14. The Heart of Space originates from one of the biggest meteorite showers of the last several thousand years, which occurred in Siberia on February 12, 1947. The shockwaves from the explosion collapsed chimneys, shattered windows and uprooted trees; sonic booms were heard nearly 200 miles away and eyewitnesses thought the world was ending. 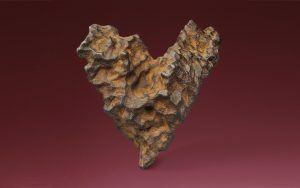 Among the meteorites to land on Earth that day was a natural sculptural form from outer space in the shape of a heart. It’s the result of unlikely yet fortuitous cleavage along its crystalline planes as it burned through Earth’s atmosphere — a fiery plunge that thumb-printed the surface and evokes the texture of a Giacometti. 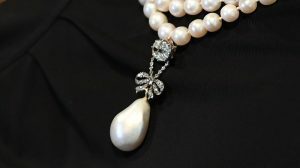 It is estimated at $300,000 – $500,000. There are 45 lots in the sale. The conservation of a former tenement house at 14 Henrietta Street in Dublin’s north inner city has been shortlisted for the prestigious European Union Prize for Contemporary Architecture – Mies van der Rohe Award 2019. This is one of 40 projects selected from nearly 400 nominations across Europe. 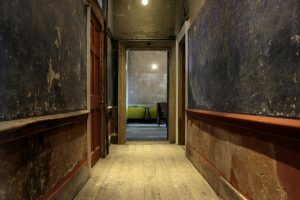 Now a home to Dublin’s social history and open to the public since last September the house at 14 Henrietta Street tells the story of 300 years of city life, all within the walls of one address. Conservation and restoration work at the Dublin City Council-owned building was carried out over a 10-year period. The St Mary’s Medieval Mile Museum in Kilkenny by McCullough Mulvin Architects has also been shortlisted. Catherine Deneuve’s wardrobe, including many one off pieces made by Yves St. Laurent, will be sold by Christie’s in Paris on January 24. Now 75 the French actress is selling her property n Normandy where the clothes are kept. The French actor was muse to Laurent for many years. At the celebrations for the 40th anniversary of his career in 2002 she told him: “My most beautiful love affair is with you”. Around 300 lots are to be sold, half at Christie’s in Paris and the rest in an online auction. There are evening dresses worn by Deneuve in Cannes, Hollywood and Venice as well as trench coats and colourful dress suits. The online only sale will offer a larger number of lots along with some cocktail dresses. 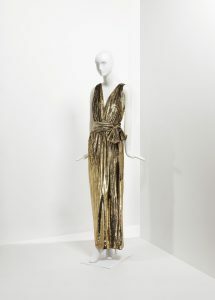 The beaded evening dress featured here was exhibited at the Met in New York in 1993. Deneuve wore the dress at a ceremony in 1969 where she met Alfred Hitchcock, Philippe Noiret and Francois Truffaut. Deneuve wore the gold lurex dress featured here to the 2000 Oscars ceremony for the nomination of Est-West by Regis Wargnier in the Best International Film category. UPDATE: The live auction of the wardrobe of Catherine Deneuve designed by Yves Saint Laurent achieved a total of $1,025,581 and sell-through rates of 100%. The interest in the sale was so immense that 90% of all 129 lots sold multiple times above their pre-sale estimates. The auction lasted 5 hours, witnessing fierce competition from around the globe. The boots worn by Johnny Sexton for the Grand Slam, le Drop and the Champions Cup made a hammer price of 15,500 at Sheppards in Durrow today. They had been estimated at around 50 euro. They were lot 1267, the last lot in a successful two day auction that saw competitive bidding in the room, on the telephone and on the internet. Sexton, who captains Leinster and is one of two of Ireland’s vice captains, has just been announced as winner of the World Rugby Player of the Year for 2018. He is only the second Irish player to win the award after the inaugural winner Keith Wood in 2001. Ireland was named World Rugby Team of the Year at the awards ceremony in Monaco on November 25. Proceeds from the sale will go towards the medical treatment of eight-year-old Anna Browne, from Mallow, Co Cork both here and in the United States. The schoolgirl suffers from cerebral palsy. THE Pink Legacy made $50,375,00 at Christie’s in Geneva last night. 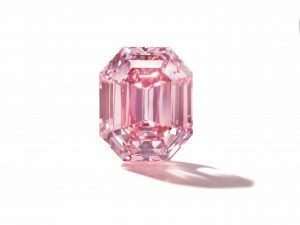 The largest and finest fancy vivid pink diamond ever offered at auction by Christie’s weighs just under 19 carats. The rectangular-cut gem was the top lot at Christie’s Magnificent Jewels auction at the Four Seasons Hotel des Bergues in Geneva. 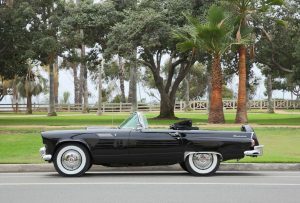 From the Oppenheimer Family it had been estimated at US $30-50 million. The auction achieved $110,214,250.